Train with no tracks!? JumpMaxx’s Trackless Train is great for all parties! Attendants: 1 included in price. 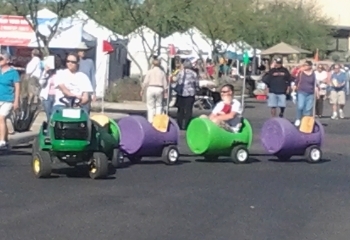 Everyone’s kids will have a blast riding around anywhere and everywhere in our Trackless Train! You get to sit back and watch your kids enjoy themselves as this Trackless Train comes with an operator to drive around your parties guests that are 12 years of age and under. JumpMaxx has worked hard and long to provide to you the most unique and wondrous interactive products to entertain your family and guests at any party, event, and fund raiser. Book early as this interactive unit is in high demand and it is first come first serve. JumpMaxx prides ourselves in providing America with newer, cleaner, high end entertainment like our Trackless Train and many inflatables!